This tutorial will show you how to draw a cartoon ear! Very often, when designing and drawing cartoon characters, the ears are only represented by a small line, most likely a curved line. But if you wish to draw a more accurate ear to one of your character, then maybe you should try following this lesson in order to create a perfect one! First, draw a thick oval shape. Make sure that your shape is incline in a 45 degrees angle just like shown on the image above. Next, draw a small circle on the bottom of your first shape to illustrate the ear lobe. Now let's refine our ear by working on its outline. Notice how the top of the auricle is round and smooth. Also, you can see that on the left of the ear lobe, the line is slightly curved towards the inside of the ear. 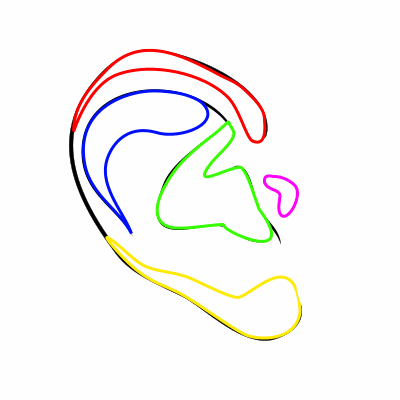 Continue sketching by adding all lines inside the ear. Each one is drawn with a different color to help you sketch them accurately. If you wish to add more realism to your artwork, you can also draw some shadows. Each of the five shadows included in this drawing are represented by a different color. Please not that these shadows are not drawn randomly. They are following the curves and lines of a real ear. So try to draw them just like the ones available in the illustration above! Finally, just add some colors to make the illustration more enjoyable to look at. Don't forget to create the small hole leading inside the head (represented by the black hole in the drawing). And there you have it! 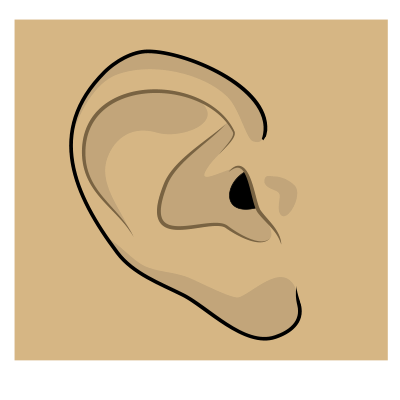 A nice looking ear drawn using some simple lines and basic shadows. I hope you had fun drawing an ear and remember to practice as much as possible!